We did not have the kids this weekend, so it was very knitting-productive. 2. Finishing it took So. Freaking. Long that I needed a short break from the thing to recover and regain any interest. I have now done so. Interest regained. I am, as has been stated before, not the world's greatest finisher. As such, my Cherry doesn't look quite as good as other people's--I don't love the way my button band ribbing pulls up and the bottom there, and my buttons are never ever evenly spaced. But--it is supremely comfortable (set in sleeves often don't set quite right on my shoulders, but these do), it's elegant, and very wearable. I wear most of my knits to work and people admire them but they also look sort of askance. What's that strange clownish sweater she is wearing?, I imagine them asking. Here I have no such concerns. I'd wear Cherry to a meeting with a client. Even a client that doesn't knit. 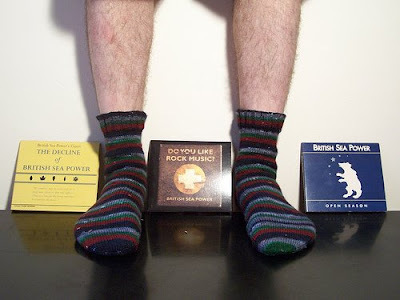 Dave could theoretically wear his British Sea Power socks to work. You know, not in the summer. Let us hope he chooses to wear them with pants. The self-striping yarn striped successfully. Admittedly, the pattern is a little boring, but I wanted them to just be stripey. And you can't really see in this shot, but there are tiny birds peppered here and there. BSP has some fake bird or other at every one of their shows. It seemed fitting. 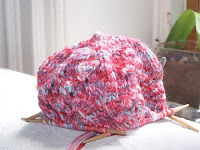 RockNoodle really wanted to make a hat out of her sock yarn, so we figured on something lacey and double-stranded. That doesn't make for much knitting that she can do on her own, but it will produce a FO that she can wear and be proud of. It's a little hard to tell, but that's Foliage. RockNoodle's Kool Aid choices don't really look much like any leaves I've ever seen, but they're very her, and I think it'll be an attractive, if less-than-leafy hat. I was sensible and cast on socks with my Kool Aid dyed sock yarn. I actually can't even tell you what colors this is made of--it was my first attempt at dyeing and I just tossed in a bunch and left it to simmer in the pot. I wish now that I had written down what I used, since it's a lovely semi-solid. Rhubarb, Dave and I decided. Early on in my knitting life, I came across Baudelaire and fell madly in love. But I was terrified. Toe up? 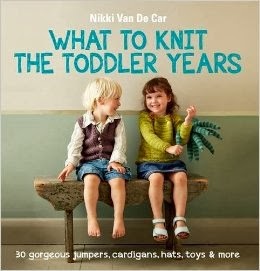 I'd never even knit socks! 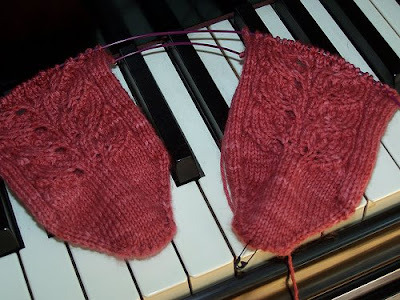 How on earth do you do gusset-shaping from the toe up? And lace? And lace + cables? Forget it. I was not worthy of this pattern. Somehow, the mysterious rhubarb-colored Kool Aid works. And the pattern is--easy. 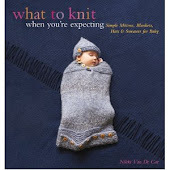 Granted, I'm somewhat further along in my knitting skills, and using a cable needle no longer makes me tremble in fear, but this is tv-knitting,. Still. I'm knitting Baudelaire. Go me. I love the style of the cherry, very flattering.